I am 21 years old, I have a bachelor of fine arts in Dance from QUT. I am currently completing my degree in secondary teaching and shall be a qualified dance and drama teacher by the end of the year. I joined Tune-up purely as a night job to help get me through my degree BUT I quickly fell in love with my job and have been here for over two years now. Over the years I have had the pleasure of developing some amazing friendships with our regular customers. Some of our regulars have been coming to Tune-up since we opened about four years ago!!!! As I usually work the LONENLY MONDAY SHIFT by myself :(. It’s always nice to have my regulars pop in to keep me company and bust out some of my favorite tunes! All of Tune-up’s regular customers are not only fun, outgoing people but they constantly support our small business. They respect the rules and procedures at Tune-up and continue to welcome new costumes into our intimate environment!!! I think this is one of the main points which separates Tune-up from normal bars. Not only is the service beyond amazing 😉 but our costumers are always friendly and welcoming to all Tune-Up new comers. THE WALL OF SHAME !!!! The staff member s here at Tune-up has also developed a “Wall of shame”. 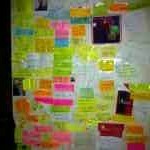 This is simply a wall of funny photos, notes and maybe some sneaky phone numbers given to the Tune-up girls. This wall started about 6 months ago and is increasing everyday. Each and every Tune-up girl has contributed to this wall in some way and we hope our new tune up girl will do the same. But personally Carly and I hope to fill the wall completely!!! So if your new to tune-up or if you’re a regular and have been slack, feel free to add a special something to our wall !!!!!!!! That’s it from me =) ! Come in and visit (especially on my lonely Monday shifts) and bust out some of your favorite tunes!!! I’m so glad Katz and the Tune Up Girls have started their own blog. Especially as fatherhood has restricted my ability to see you all as much now. At least this way I can keep in touch with what you’re all up to! It doesn’t matter if regulars such as myself have been away from Tune Up for two days or six months, you always make us feel welcome. bands whilst attending Tune UP, as well as shared the stage with some great and not-so-great singers!! come into my store and ask what places are a “must” to visit, Tune Up is always the first place that comes to mind.